I've always been quite domesticated, even when I was much younger. I never enjoyed going out too much, especially when I know it's going to be loud, crowded or that I'd smell like cigarette smoke and end up with a migraine at the end of it. No thanks. I've also always been comfortable with housework and enjoyed cooking and most of all, organizing. But I never realized the extent of this domestication until last night. As our family was having dinner, there was just one thing on my mind and that was my excitement to tell my husband about the 'project' I finished for the day. I told him I had done something involving one of our closets. I wanted to build some suspense so I didn't bother to elaborate. Instead, I told him and my son to finish their meal and go upstairs so I can show them. I felt like a proud school kid about to show off her artwork to her parents. Or maybe a middle-aged man about to shock her wife with a new blazing red sports car sitting in the garage. Either one will do. Anyway, as soon as the dishes were put away, we all headed upstairs so I can show them what I had done. 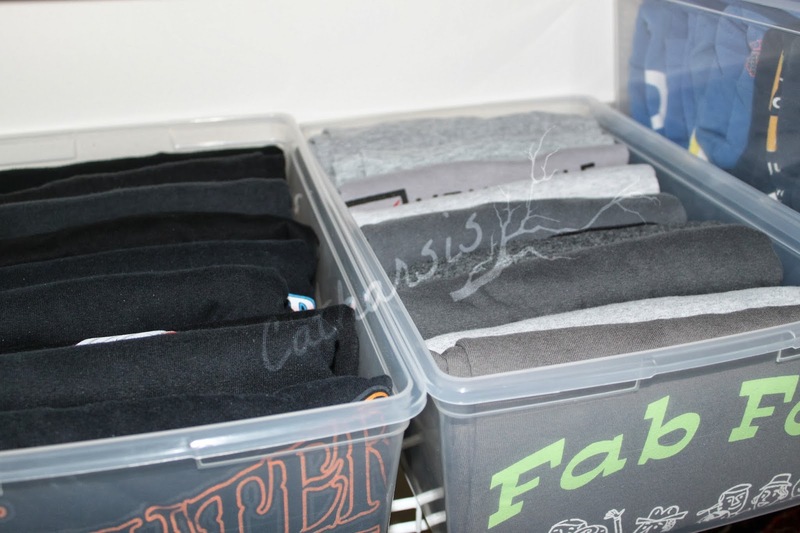 I decided to finally organize my husband's shirts. Color-sorted and nicely folded in bins. I just couldn't stand it anymore how, every time my husband pulls out a shirt, everything else on top of it got messed up. It was something my toned-down OCD just couldn't bear any longer. So, I took some extra bins and put an end to the stacked-shirts problem. Upon deeper reflection, I was ready to admit that this is about control. Recently, I've been feeling that a variety of things in my life are beyond my control. It's as if, left and right I'm surrounded by circumstances or realities that I can't change in spite of my efforts; or things that I just know are not for me to change and no amount of steering would matter. And because I don't like this sense of loss of control, and to a certain degree, powerlessness, I turn to things I have control over. Things. My need for a sense of order definitely translates beyond 'things' and when I clean and organize my space, I know it's my way of seeking some semblance of order in order to fight the sense of chaos that I feel is nibbling its way through aspects of my life. My categorizing things and containerizing them is my way of asserting power and maintaining control. It's my own way of stepping on the brakes and feeling that I can somehow slow things down enough for me to catch my breath, think things through and once again be comfortable enough to go with the flow. Whatever figurative 'mess' I feel I can't clean up around me, I turn to some corresponding physical mess to clean up and put my energy into instead. It becomes both a distraction and a source of comfort, albeit superficial. I know this and there is no need to judge me. It's either that or you'd have to bear with me snapping at you or worse, have me bite your head off. Your choice. Just don't say you've not been warned. I don't know how long this feeling of powerlessness and frustration will last. I know it will pass. I've been here before. In the meantime, I still have a few more closets and cabinets calling my name. They will be my friends for a while as they give me sanity while I make them look pretty. That's a good enough deal for me. What activity do you turn to, either as distraction or source of comfort, when you feel a sense of imbalance or powerlessness? I actually love that you are taking control of what you can. That is something I really need to do more of, it's too easy for me to grab a cookie or just sit and feel powerless. Thanks for a great idea. Joy I am so sorry you are in this place though and I hope that it will leave very soon! Much love! A tidy house= a tidy mind. I say: control what you can. The rest will follow.